Here Comes Honey Boo Boo, you like them or not they just don't care! “Here Comes Honey Boo Boo” is finally landed on British screens and the first two episodes, broadcasted on new channel TLC, have delivered what they promised: an hour of pure US-style entertainment! Meet the Thompson family: 6-year-old Alana AKA "Honey Boo Boo Child", the smallest and most in-your-face member of the household, as well as next Miss America wannabe; larger than life “Mama” June, the one who rules the roost, 12-year-old Lauryn “Pumpkin”, the crazy tomboy, 15-year-old Jessica “Chubbs”, Mama's mini-me, 17-year-old Anna “Chickadee”, the "preggie" one, as Alana likes to call her, and chalk mining dad Michael “Sugar Bear”. Yes, and of course Honey Boo Boo's best friend “Glitzy”, a male teacup pig that she loves dressing up in princess clothes. Alana's first appearance on TV was a few years ago in the reality pageant program “Toddlers and Tiaras”. Her bubbly personality and her wacky family immediately caught the eyes of the producers, who turned her natural talent and love for the cameras into a profitable franchise. Since then the crew moved to McIntyre, South Georgia to shoot every single action, and fart, of the Thompsons. Despite a bitter criticism from detractors, “Here Comes Honey Boo Boo” is rather enjoyable. It is a reality and, as everyone knows, most of the lines are scripted or spoon-fed to make people laugh. So it doesn't come as a surprise to see the best of the worst behaviour caught on cameras. The show doesn't want to be a lecture on poverty in the Southern States of America, nor a documentary on rednecks – although “Chubbs” rejects the title as all of the family members have their teeth. The ‘pop culture phenomenon’ wouldn't be that if it just portrayed a very down to earth, cheerful family. It had to be extreme: tacky pageant competitions, grunting pets, blowing noses on napkins and mud bathing. The quintessence of reality TV. And that is what we like about Alana's Family the most, they are the next Simpsons in the flesh. They lack of good manners of any type, they're constantly chomping on junk food, they look down at people (Mama criticising half-naked fat ladies at The Redneck Games was hilariuos), they fart out loud laughing about it and they especially love themselves for being the way they are. As Mama put it: “You like us or you don’t like...we just don’t care”. 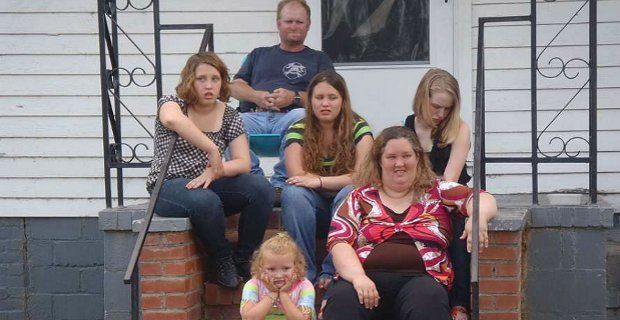 “Here Comes Honey Boo Boo” is aired on TLC at 9 pm every Tuesday.